Entry conditions are clearly defined. Very simple bare chart system. Rare occurrence of the proper conditions. An inside bar is a bar or a candlestick that completely fits into the first preceding bar (also called a "container" bar), including its High and Low values. If the current bar has an index of 0 and the previous bar has an index of 1 then the following conditions should be true for the current bar to count as an inside bar: High < High and Low > Low. Mind the strict "greater" and "less" operators. Bearish inside bar that follows a bullish "container" bar on the clearly visible uptrend signals a Short position. Bullish inside bar that follows a bearish "container" bar on the clearly visible downtrend signals a Long position. 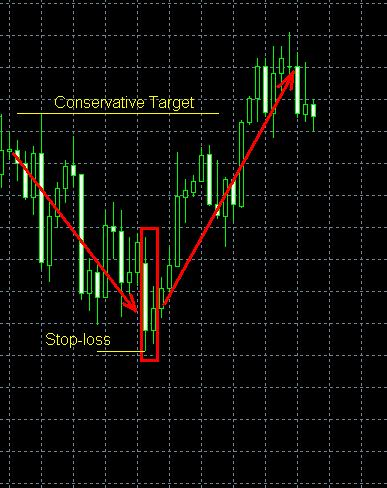 Stop-loss is set to the Low of the "container" bar for the Long positions and to the High of the "container" bar for the Short positions. Take-profit should be set to the nearest support/resistance level formed by the trend. A bullish inside bar after a downtrend is shown on the example chart. The inside bar is easy to identify and the stop-loss level is rather conservative here. The target was set to the resistance level formed by the previous downtrend. As you can see, the currency pair rate reached the take-profit level without any problems.